I never watch Persian TV. However, tonight I had the pleasure of watching you on PNN TV speaking about Islam. I must say that on one hand I was impressed with your eloquence, erudition and politeness, something rarely one can see in Muslim preachers. On the other hand I was disturbed to see an educated person like you, quite modernized in appearance and style, engage in so many logical fallacies and present black as white. I was hoping for the question period to call in and explain a few of your errors. But unlike most Persian programs there was no question period. 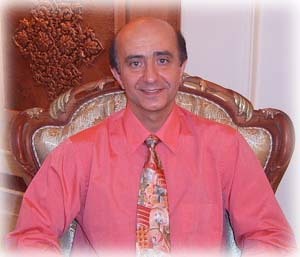 Dear Mr. Entezam: Defending Islam is a lost cause. As part of the clerisy it is incumbent on you to be truthful. Our country was destroyed because of Islam. I have dedicated the last eight years of my life disproving Islam. My site is visited by hundreds of thousands of people every month and I have been quite successful showing to the world that Muhammad was no prophet of any god but a mentally deranged loony no different from psychopaths such as Hitler, Jim Jones, Shoko Asahara or David Koresh. My, once decried as maverick and extreme views, are gradually becoming accepted by the mainstream as the only uncompromised truth and my site is gaining more visitors. It is brining about, as some have put it, a silent revolution with the potential to eradicate Islam in a few short decades. If you are honest, which according to my first impression you are, I would like to invite you to engage in a public written debate with me and prove me wrong. I have issued this challenge five years ago and since January 2005 I am offering $50,000 dollars reward to anyone who can prove that Muhammad was a prophet of God in a logical and objective (not subjective) way or if that is not possible at least prove that my charges against him are unfounded. Forget about proving him to be a prophet, just prove that he was not a monster and I remove my site and give you $50 K. Several Muslim scholars have tried and all of them have failed. Our debates are published in the debates page of my site. I know that the reward is not an incentive for you, nonetheless, you seem to value honor and therefore I appeal to your honor and to your commitment to the truth. Are you willing to engage in a public written debate with me and show to the world that I am mistaken? This would be the test of your sincerity. Dear Mr. Entezam. I must say that I was captivated by your dignity and manners. I have heard a lot of brays of Muslim preachers. I am not concerned about them. But you are courtly, soft spoken and quite classy. This concerns me. You have the appearance of being honest and well educated. You come in an amenable and beautiful package. So my concern is that people may fall for the package and be defrauded with the wrong product that you promote. Although I have utmost respect for your erudition and scholarship, and particularly admire your genteelness, I value honesty more than anything else and when it comes to defending the truth, I am ruthless. There is a lot at stake here. The survival of mankind is at stake here. I can�t stand insincerity and hypocrisy. Not when something as important as the future of mankind and the survival of human civilization is at risk. If you truly believe that Muhammad was a messenger of God, prove that to me and to my readers. We are millions. Therefore you can�t snob me. We are worth your time. If it is the truth that you care about, you should care about us. If my site is spreading lies, it is growing by leaps and bounds. If you honestly believe in what you preach, it is your responsibility to save all these people who are being misled by me. I am giving you the platform to defend Islam, something no Muslim site will ever give to the critics of Islam. If that is not the case and you are not sure about what you preach then you are misleading people and I urge you to stop doing that. I have dedicated my life to end Islam and the madness that comes with it. Let us put the niceties aside and be honest to each other. This is war. I am fighting to save mankind and you are my opponent. Should you accept this invitation, I will publish our correspondence in my site and it will be read by millions of people. If you manage to prove me wrong, I will admit to my error and remove this site. Actually I will do better. I will become your disciple, translate your speeches into English (although obviously your English is better than mine) and publish them in my site. What can be better than that? Since my site is world famous, you will become world famous instantly and a hero to all the Muslims. If you prove me wrong and I don�t admit defeat out of pride, you win anyway. The readers will see through my dishonesty and that would be the end of me and my site. � copyright You may translate and publish the articles in this site only if you provide a link to the original page.